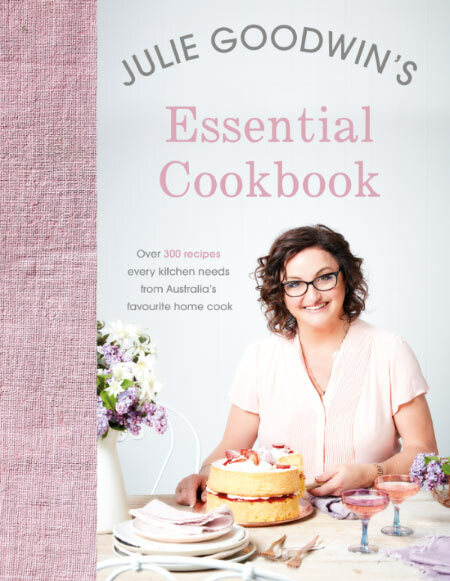 In collaboration with Hachette Australia we have 4 copies of Julie Goodwin’s Essential Cookbook up for grabs. Julie Goodwin first came to the attention of my little family (& most of the Australian public) as the winner of the hit television show MasterChef Australia way back in 2009. We had recently relocated to Perth from the mostly sleepy little town of Salamander Bay on the NSW Central-ish Coast. We were finding our feet when it came to the big smoke, especially when it came to sourcing local affordable produce. Hubby was away at sea with work a lot and I’d gone from cooking from scratch and spending hours in the kitchen, to couldn’t be bothered the convenience factor which resulted in a lot of quick and easy uninspiring last minute meals hitting the table on repeat. We no longer had family and friends dropping in at a moment’s notice, I no longer had so much time up my sleeve and we found ourselves with access to more than one supermarket, even if the prices here in Perth, compared to NSW, were a huge slap in the face and there was no Sunday trading back then. I remember my girls drooling over avidly watching Masterchef at the time, talking about the cooking from scratch good old days and then starting a little in-house Masterchef challenge of their own. We had a large and abundant lemonade lemon tree in that house and that’s where they started. A lemon cooking challenge. The results were amazing. Especially given, someone else was doing the cooking and most of the cleaning. Although given their youngish ages (10, 11 & 12) there was still a whole lot of supervision and taste testing involved on my part. It was Julie Goodwin’s 20/20 Meals – Feed Your Family for $20 in 20 Minutes that spoke to me the most. Cooking to a time and a budget with meals that are family friendly. What time and budget conscious family wouldn’t benefit from that! Whatever ingredients you have in the house, no matter the season or occasion, you can put together a tasty feast that will please everyone, every time! Julie Goodwin’s Essential Cookbook, her latest creation, is possibly my next favourite. There are a few reasons why. Despite the picture perfect cover, the cookbook itself isn’t picture heavy. For a paperback, an impressive one at that, it is heavy though. It’s jam packed with over 300 everyday essential budget friendly recipes. Julie has written this cookbook with her adult children in mind. It’s a surprisingly diverse line-up of recipes, including familiar family favourites that remind me of my Nanny Betty and when I was first introduced to cooking. So for me, a lot of the recipes felt like a trip down memory lane to a time when I was finding my feet in the kitchen for the first time. Spending time together in the kitchen cooking and the sharing of secret and not so secret recipes and time at the table, is a family tradition in our house and I find this cookbook helps to carry on this tradition. Creating even more of those precious memories in the process. Julie clearly shares my way of thinking with this cookbook and has even included several blank pages at the end for you to make notes or include your own recipes. It’s the kind of cookbook you’ll treasure and eventually pass down to your children full of fingerprints, notes and bookmarked pages. If you’ve only got space for one cookbook in your life and you want something that covers all the bases, basics and more… this truly is your cookbook! The book is set out in 8 categories with an alphabetized and fairly comprehensive index. Of course, I’ve reversed the cookbook category line-up above because our choose your own menu planning adventures tend to start with dessert before we work our way backwards in this house. Baking comes in a close second. Recipes such as Melt and Mix Cupcakes, Zucchini Slice, Anzac Biscuits and Orange Poppy Seed Cake are on high rotation thanks to being back at school, as we slowly make our way through the entire cookbook. And it certainly is a cookbook worth working your way through. Personally, I’m really looking forward to attempting the gluten free bread and some of the less traditional, more modern recipes like Soft Shell Crab Tacos, all the while wondering what my late Nanny Betty would have made of them. For the most part though, this cookbook reminds me of her. Of all the fun times we had in the kitchen together. Sometimes her kitchen, a lot of the time the kitchen at the bistro where she worked and cooked on mass. Such great times. Such great recipes. Such fond memories. This really is the perfect cookbook to give to your older (still living at home) children for Mother’s Day with a massive “HINT HINT you should be cooking more” attached but it would also make a great “it’s time to leave home” gift as well. It really is the essential cookbook to pull out when the kids look in the fridge or pantry when it is far from empty, proclaiming there is nothing to eat. Although, I must confess, I may have been guilty of doing that myself when I’m feeling uninspired at dinner time. Haven’t we all? For me, Julie Goodwin’s Essential Cookbook is going to be sitting pride of place in the kitchen of our new home when we move later this month, inspiring us to come together over food and favourite recipes, creating more beautiful family memories, as well as children that know there way around the kitchen before they leave home, in the process. Published by Hachette Australia in April 2017. Paperback RRP $39.99, Ebook RRP $17.99. 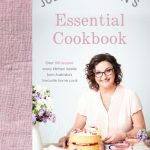 Thanks to Hachette Australia we have 4 copies of Julie Goodwin’s Essential Cookbook up for grabs. Comment below letting me know your first or favourite memory when it comes to home cooking. Click on the ENTER HERE banner, add your details and review our giveaway terms and conditions. Managing Editor of Agent Mystery Case. Follow Raychael aka Mystery Case on her mystery adventures 'casing' people, products and places to bring you her worth casing favourites.